I've been slowly getting back into doing traditional 12x12 scrapbook layouts again, and this past weekend I wanted to play, but didn't feel like scrapping a page about Austin. 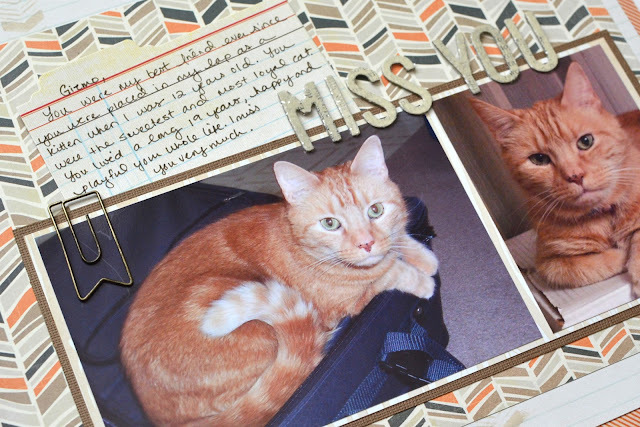 What I thought would be nice is to finally do a special layout dedicated to my kitty Gizmo, who passed away in October of 2011. He was almost 19 years old when he died and he was truly my best friend for more than half of my life. Warning, this next part is a little sad so if you want to skip and look at the pictures, feel free! In 2006, I accidentally caught Gizmo's tail in our bathroom door and the tip was cut off. He ended up having about half of his beautiful tail amputated. However, it was a blessing in disguise (I know this sounds weird) because as he went in for surgery they discovered he also had a hyperactive thyroid. He was losing weight fast and the vet didn't expect him to make it more than a year or two. We put him on thyroid medication right away, and my sweet kitty lived quite happily (albeit a bit thin) for over 5 more years. I am thankful we caught his condition and I had this time to spend with him. It almost seemed like he hung on just long enough for Austin to be born, because shortly after Austin's birth he started getting sicker and thinner. The last few months of his life we kept him in our laundry room so that he would not be sick around the house. (It's actually a pretty large space, and he was really content in there to hang out by himself without the other cats bothering him). One October morning I went in to give him his medicine and found him curled up in his little crate, barely moving. I thought he'd passed but he whimpered a little meow and I knew it was time to say good-bye and bring him to the vet. I'd always said I wouldn't be able to do that, because it was extremely hard when we said goodbye to Brad's kitty Ming years before, but this morning, I knew it was time. I had an hour or so to sit with him and say good-bye, which I am very grateful for. Gizmo was such a great kitty. He slept with me I got him as a kitten. He'd curl up under the blankets beside me for warmth. Later in life he always jumped up and slept by my head at night. I feel that I was closer to him than any other pet I've ever had. Cuddling him was comfort when I needed it. He was sweet and playful and he'd "talk" to me. I could not have asked for a better kitty. 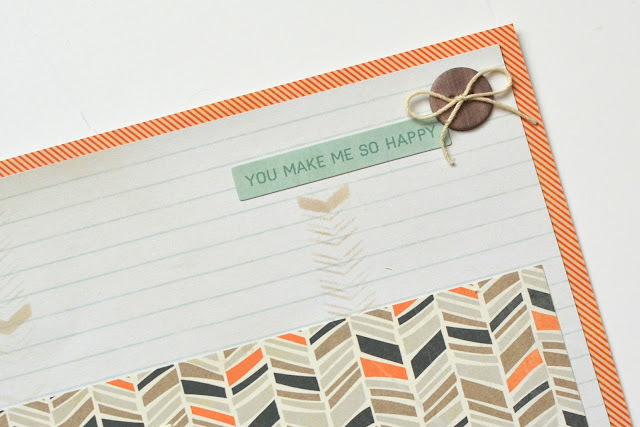 I had this orange striped paper that was part of the BasicGrey Fact stack ($4.79 on clearance at Joann's). It was really bold so I only wanted it as a border around the whole page. I layered a sheet from the DCWV Snapshot Stack on top of the paper, cut down to 11.5 inches square. Over this, I found a sheet of orange, brown, and black chevrons from BasicGrey for Studio Calico. Framing my photos is a sheet of brown Coredinations card stock from Joann's, and then another paper from BasicGrey for Studio Calico. I love how all of these papers, while different lines, work beautifully together. Once I had these papers picked out, the layout went fairly quickly. I used a chevron stencil from Studio Calico and VersaMagic Wheat ink with a sponge dauber to add a few light random chevrons to the DCWV paper. At the top I added a sticker from My Mind's Eye The Sweetest Thing Tangerine and a little brown chipboard button, from My Mind's Eye The Sweetest Thing Bluebell, which I tied with twine. For my journaling, I found a BasicGrey Fact & Fiction journaling cards & transparencies pack at Joann's for 97 cents on clearance. 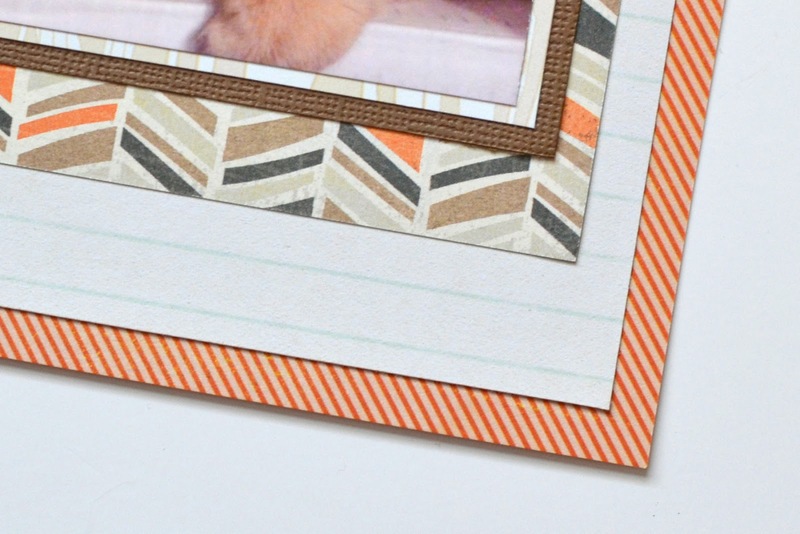 This little tabbed card was perfect to slip just behind my photos. I also used a metal clip from Prima, but I didn't want it to lift up my photo so I used a Zig glue pen and just added it right on top of the photo. The "Miss You" title was made using Dear Lizzy Treasure thickers. At the bottom of the layout to finish it off, I added three small sparkly brads from Recollections. I love how this layout turned out. I like that the colors are masculine and really show off how brightly orange my Gizmo was. 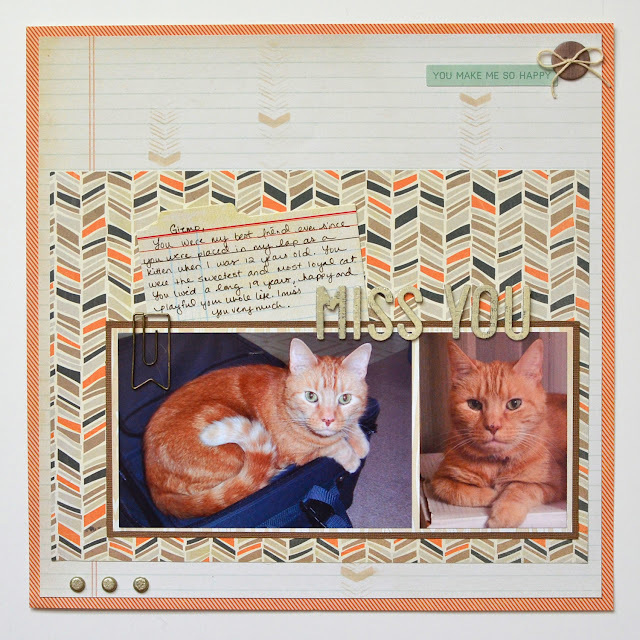 Right now, I am adding my 12x12 layouts right into my Project Life album during whatever week they belong with (if I use a photo from a specific week, the layout goes in that week, or, for example this Gizmo one will just go inside week 31 because that's when I made it). If I make a lot of layouts I may put them in their own binder someday but right now they work well in my Project Life album. I just insert them into one of the Becky Higgins 12x12 page protectors. 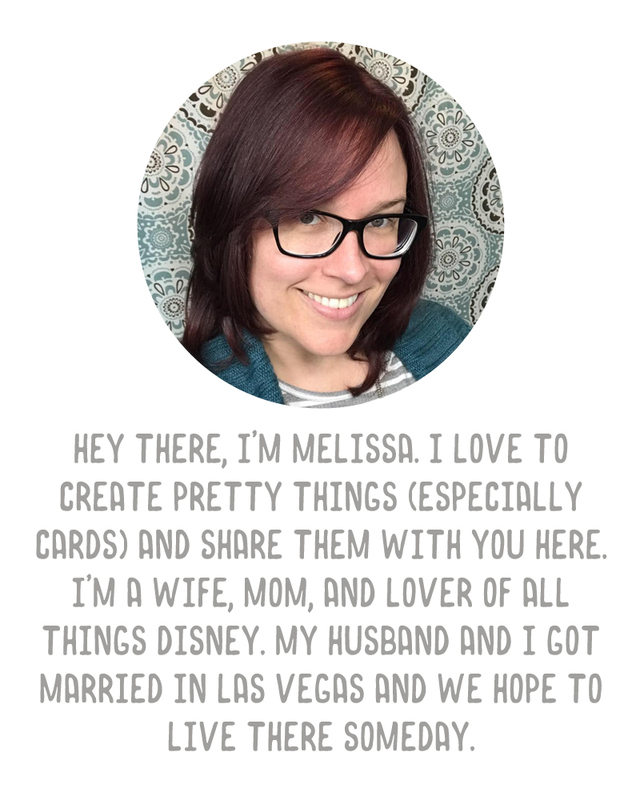 Do any of you do both Project Life and traditional layouts? What do you do with your layouts when they are completed? Aw, that's very sweet! After doing this one I did at least decide to do one for Sadie when we got her as a puppy, and for Eddy because he's super photogenic. Vegas is hard to capture because she's super skittish. So yes, I'll share more in the future :) Thank you! Got me crying this morning...I will blame the preggo hormones! lol!! Such a sweet story and I love that you did this for Gizmo! We have Hooch, he is 11.5, and we adore him! He is by our side all the time. I have been dreading the day when he will go, as Weimereiners have a life span of 12 to 14 years. I want him around to meet our son and I want them to be best friends too! It's crazy how attached me get to our pets! They are amazing creatures! I will say, I was far more attached to Gizmo than I am to our current pets. I love them, but Gizmo I think was my baby before I had my real baby, and I think that's why I had such a close connection. Now that Austin is here, that mother/son connection is so strong that I don't have the same with my cats and dog I have still as I did with Gizmo. It's different. I'm sorry for the loss of your beloved kitty. I had a pup that was my best friend. I love the layout. 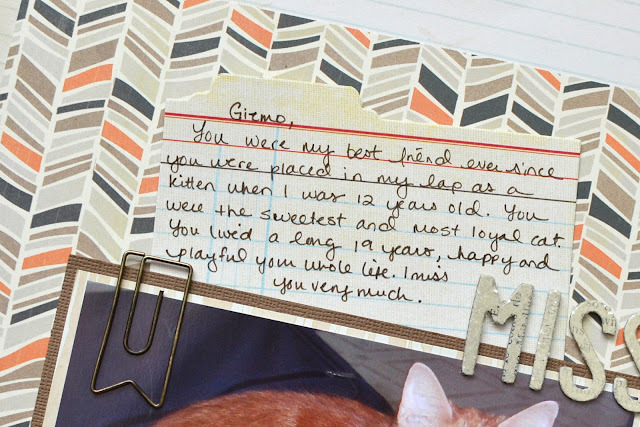 You should print this story to put on the back of the layout for future family to know how much Gizmo meant to you. Aw. Same to you too. And that's a great idea, thank you. Gorgeous, gorgeous, gorgeous!!! What a wonderful, beautiful, heartfelt tribute to Gizmo. When I read your words, I felt like I could've said them. I've had to endure the loss of several pets through my life, and because I adore sharing my love, it will continue to happen. Your Gizmo reminds me of my kitty Buster, who came into my yard one Spring to help (or supervise) me planting flowers. Nine years later, he was diagnosed with FIV, and lived another two years, but in 'his room' away from everyone. It broke my heart, but it was best for him. I miss him terribly each Spring, because I loved watching his long hair and fluffy tail move in the warm breeze. Most recently (this past January), my basset hound died after having seizures the last five years. I am still not over it, and cry several times a week because I miss him so much. When you said Gizmo hung on until after Austin was born, it was the same as the deal I made with Droopy-Doo last fall ... wait until after the holidays, which he did. ((hugs)) to you, and thank you for sharing this amazing page!!! :( It's amazing how close we can get to pets. I do love animals but I think after our current brood passes on (which won't be for a long time, likely) I may need a little break. It's heartbreaking to lose them. Love the colors on this layout. 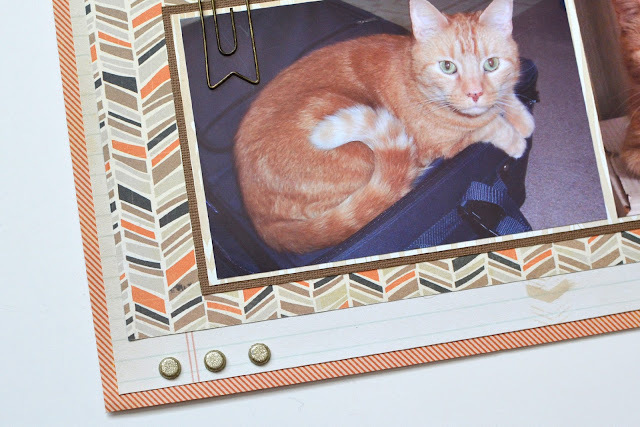 I like your idea about putting traditional scrapbook pages in with Project Life. I will admit I haven't done any traditional pages since I started doing Project Life about a month ago.